. Do they look like a solid design/plans? Are there any weak points I might need to watch out for? Also it talks about using steel bolts for the khana... I have heard those can raddle in the wind and make it sound like jingle bells haha. So I would prefer to use something like rope to tie the khana together. Would rope be strong enough for your larger sized yurts? I was thinking of doing a smaller test yurt before I make the large one but even so what are your two cents on the above. Thank you all for your time and thoughts/experience in these matters. I don't know squat about 24 foot yurts, or any partitioned yurt, so am not qualified to comment. Building a 16' yurt will be a VERY good learning experience. I heartily endorse that idea. I have built 16', 14', and 12' simple nomadic yurt. Those certainly can be tied with rawhide or good solid core braided cordage. I bolted mine with 1/4-20 carriage bolts. The mistake I made was using washers, which do in fact rattle if the bolt is loose enough to allow the khana to open and close easily as the wall goes into the circular position.
. The material dimensions are 'on the money'. Only for discussion my "quick´n dirty made" first raw drawings as "Kick-off-Step" for my project. The living-space (30') with a loft (double-bed for guests) is connected with a hallway to the sleeping-room (24'). Beside a office-space (24') is planned and a yurt (16') for storage & technical equipment. and a floor-heating. Additional a wood-stove (additional water heating!) in the living-space should create a cozy atmosphere. The technical environment should be prepared for grid-off-situations too and a 23 kw Solar-Energy-System is supporting that. Water purification is a important point. Please have a look to my raw plan - I am open for all your comments & suggestions! How much experience do you have with yurts? Have you lived in a yurt before? Do you have friends that live in one, and have become familiar with yurts? If not, the conservative approach would be to build the 30'er, that has all basic amenities, and live there awhile. Tthen you can head into the 'build out' with actual yurt living experience under your belt. Just a thought. Good luck. How much experience do you have with yurts? Have you lived in a yurt before? Do you have friends that live in one, and have become familiar with yurts? If not, the conservative approach would be to build the 30'er, that has all basic amenities, and live there awhile. Tthen you can head into the 'build out' with actual yurt living experience under your belt. Just a thought. Good luck. I am not the type of person for "conservative approaching". And I need to have a comprehensive view for realizing my (our) project. 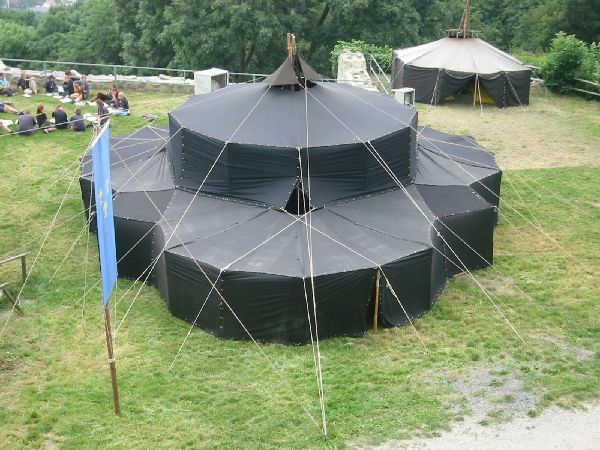 Can not start with a single yurt for testing it and do not see that as necessary too. I am interested in additional comments toward my raw drawing an project ideas. Sorry. I didn't reread the thread. I've never lived in multiple dwelling scenario regardless or dwelling type, so can't make an experienced comment about such design. In fact I have never lived in a large Westernized yurt either, so no comment about that either. I HAVE lived for 3.5 months in a backpacking tent when in my early 20s and that doesn't really qualify either. I have a nomadic camping yurt out back of our place, and that is just a hang place out of the house for when grandkids vome over or I want some 'me' time in my rustic yurt.